During holidays or summer breaks, fishing is one of the few activities that most individuals try. To some people, it’s the best way to pass the time. But, from an expert’s point of view, fishing offers many benefits than one could ever imagine. For example, it helps one relax the mind, as well as, promote the bonding between families or friends. Fishing also acts as a source of nutritious food. Besides, the activity itself is beneficial to the body as you get to exercise. If you’re reading this, probably you’re planning to start your fishing experience. But, you’re not sure where to begin. Without saying much, here is a list of the basic fishing gears to get you started. A fishing rod is one significant gear that you require for the fishing. It’s usually a slender pole made of durable and flexible materials. That said, a fishing rod allows you to cast your fishing line deeper and further into the river. Fishing rods come in different designs. Therefore, you should choose a rod that matches the kind of fishing you’re planning. A fishing reel is usually attached to the rod. Its function is to help wind the line and draw in the catch. Spinning reels are suitable because they can be used on the shore, and on a boat or any other scenario. A fishing line is also essential. Today, you can find different designs of fishing line based on the material used and the diameter. Therefore, you must choose a line that suits your fishing style. For example, when going for larger fishes, always pick a line with a large diameter. It’s strong. Also, the material used does play a significant role. For example, fluorocarbon lines are almost invisible and abrasion resistant, hence suitable for fishing. As the name suggests, hooks are what you require to catch the fish. They poke the fish in the mouth while going for the bait. Hooks are usually sharp that at times they get caught in a fish’s body. 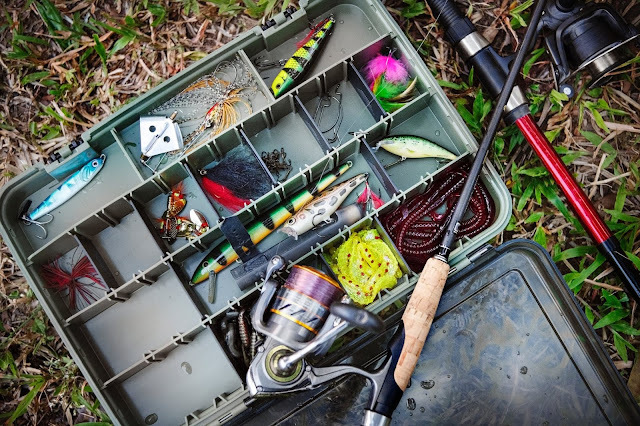 By taking a shallow dive at fishingpicks.com, you will realize that there are different types of hooks such as the circle, single, and double among many others. As a beginner, you can go with a single hook. However, it’s advisable to stock hooks ranging from various sizes. The worms are usually attached at the end of the fishing line and play a crucial role in attracting the fish. However, you should have in mind that fishes have different taste of food. So, the worms may not work in every scenario. Some fish prefer corn, bits of hotdog, smooshed bread, and grubs among many other baits. Therefore, it’s advisable to confirm with the fellow fishermen if you have got the right bait. Bobbers, referred by many as floaters, are also an essential part of fishing. Bobbers help in keeping the bait closer to the surface. Thus, it becomes easy to tell when a fish gets attracted to your worm. It starts sinking whenever a fish eats the bait, hence warning you to reel your catch. Hooks are supposed to remain deeper in the water. However, they are light and sinking may be impossible. That’s where the sinkers come into play to ensure that the hooks maintain the depth. Also, the sinkers help in stabilizing the fishing line, hence making the whole task easier. You must ensure that you’ve some extra sinkers with you as they easily get lost while fishing. Fishing means that you’ll spend most of your time under the sun. Therefore, you must ensure that you’re protected from the sun. You can apply some sunscreen and bring some sunglasses with you. Also, a hat or cap goes well with the unforgiving sun. Many people go fishing for fun. However, they ignore the many benefits that come with engaging in the activity. In this article, there are top seven gears newbies can use to get started with the activity. Read through each one of them and see how simple it is to join your fishing buddies.